The new documentary Two Spirits depicts the true story of Fred Martinez, a 16-year-old Colorado teenager slain for being a “two-spirit” -- a masculine spirit and a feminine spirit living in the same body. Director Lydia Nibley pauses ahead of the film’s November 21 world premiere at the Starz Denver Film Festival to discuss Martinez’s story and the nature of gender within Native American culture. Advocate.com: How would you describe your film? Lydia Nibley: [It’s about] a mother’s loss of her son and provides a revealing look at the history of a time when the world wasn’t simply divided into male and female, and many Native American cultures honored people of integrated genders. [It] explores the life and death of a boy who was also a girl, and makes the case that we need to return to traditional values. At age 16, Fred had begun to understand that his identity was a special gift according to traditional Navajo culture. He was nádleehí, which means a male-bodied person who has a feminine nature. How many genders do the Navajo have? There are four genders in Navajo culture -- the feminine woman, masculine man, nádleehí, and dilbaa`, a female-bodied person who has a masculine nature. The idea of multiple genders isn’t very well known. As the native experts in the film describe, many North American tribes have multiple gender systems. They believe that someone with a more complex experience of the masculine and feminine can bring a deeper understanding to negotiating conflict, counseling couples, parenting, healing, and serving as an ambassador. There are tribes with as many as seven or nine genders, and that reflects much more of the truth about the human family than a binary gender system, Adam and Eve, and that’s it. Where does the term two-spirit come from? The term "two-spirit" is sometimes used interchangeably with “LGBT,” but the spectrum of sexuality and gender as described in many Native languages and traditions goes beyond and between those four categories. Native people created a term in English that could help differentiate and describe this rich tradition. But it’s important not to appropriate the term, but to honor those who use it. What prompted you to tell the story of Fred Martinez? I’m convinced that telling powerful stories is one of the best ways to challenge bigotry and bring about change. I hope the film moves people and sheds light on an approach to sexuality and gender that can be absolutely revolutionary. What has the response to the film been like so far? We screened as a work-in-progress and the response was overwhelmingly positive and enthusiastic. The screenings were helpful in fund-raising to finish the film and people shared their personal stories with us, including a two-spirit man who I will never forget. He tearfully hugged me and thanked me for making the film and explained that he had been left for dead in a remote location under circumstances very much like Fred’s murder. 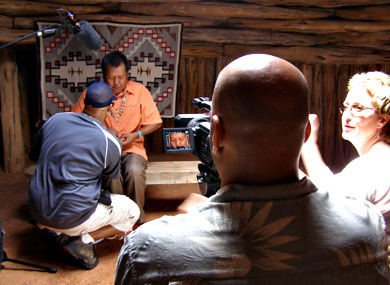 It was difficult for him to see the film, but having lived through a brutal beating, he had dedicated his life to anti-violence programs and said he is doing everything he can to connect others to Two Spirits. What can we learn from Fred's story? I think the overarching message of the film is that we are all enriched by multi-gendered people, and that all of us -- regardless of our ethnicity, gender, sexual orientation, or cultural heritage -- must be free to be our truest selves. Why do you think the Colorado district attorney didn't understand that Fred's slaying was a hate crime? The activists working with Fred’s family discovered that the D.A.’s knowledge of the hallmarks of a hate crime was very limited. Unfortunately, too many law enforcement officials don’t know what to do to protect vulnerable populations and many are not knowledgeable about preventing and prosecuting hate crimes. It took advocacy by anti-violence groups and LGBT activists to ensure that law enforcement, the media, and the public understood that Fred’s murder was hate-motivated. The 19-year-old who murdered Fred by bludgeoning him with rocks bragged to friends that he had “bug smashed a fag.” That’s a hate crime. What can we do to support the acceptance of two-spirit culture?